The Internet continues to grow bigger and bigger, thanks to growing number of Internet subscribers and Internet connected devices according to Akamai, which is about to release its latest State of the Internet (for Q1, 2011) report. The Internet’s expansion is accompanied by steady growth in bandwidth and connection speeds, Akamai’s research shows. Nearly 60 percent of South Korean broadband connections had speeds of above 5 Mbps. South Korea also achieved the highest average connection speed at 14.4 Mbps. Hong Kong had an average connection speed of 9.2 Mbps, and Japan came in third with 8.1 Mbps. More than 40 countries/regions saw average connection speeds increase by 10 percent or more in the first quarter, a healthy sign for broadband adoption overall and even better news for startups building applications that consume a lot of bandwidth. Nearly 72 percent of all broadband connections in the state of Delaware were faster than 5 Mbps. Delaware also had the highest average connection speed, at 7.5 Mbps. Based on data collected by Ericsson, mobile data traffic saw 130 percent yearly growth in the first quarter and is now more than double the measured volume of voice traffic. During the first three months of 2011, there was a 5.2 percent increase in the number of unique IPv4 addresses connecting to Akamai’s global network. US, China and Japan were the top three countries in terms of unique IP addresses. Japanese cities of Tokai, Shimotsuma, and Kanagawa were the three fastest cities in the world and had an average connection speeds of 13.2 Mbps, 12.9 Mbps, and 12.2 Mbps respectively. Lyse, Norway at 8.1 Mbps is the fastest city in Europe. 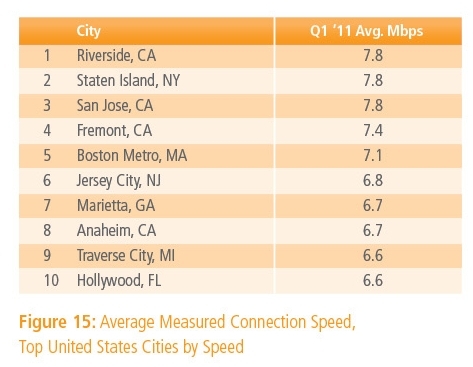 Riverside, California had the highest average connection speed in North America of 7.8 Mbps. Asia had two-thirds of the top 100 fastest cities with Japan alone accounting for 61 cities. Eighteen cities from the United States and three from Canada made the list while Europe accounted for a dozen cities. Delaware had an average broadband connection speed of 7.5 Mbps, followed by Rhode Island with 6.8 Mbps and Wisconsin with 6.0 Mbps. Riverside, Calif., Staten Island, New York, and San Jose, Calif. are the three fastest cities in America with 7.8 Mbps in average broadband speed. Five out of top ten broadband cities are from the East Coast, thanks to the presence of Verizon’s FiOS and Comcast. The misleading part of this story relates to speed claims. Bandwidth is not speed. It is capacity similar to a large truck. That large truck can carry a lot of data (the capacity) and still be jammed up in traffic (the network latency and round trip times). Information on cities is nonsense because there is no guaranteed way to get the physical location of what’s behind an IP address. I am curious as to what data you gathered from Portugal. My perception is that commercial and marketing “hype” have driven our customer internet speeds to ever demanding ones. I work in a cable company and out average customer is far above 10Mbit. Well, Latvians have one of the biggest and fastest growing fiber optics networks (biggest in contrast to the size of the country). And 100mbps connection costs ~20bucks a month – cheap and fast. I wondered that myself although I must say I was pleasantly surprised being a Fremont resident myself. Perhaps, we should await for the actual report to be published today in the AM: http://www.akamai.com/stateoftheinternet/ – according to Akamai … this was just a pre-publication by GigaOM. To a casual observer, it’s surprising that there aren’t more affluent, tech company-infested places like Mountain View and Palo Alto up there with Fremont.